The AGA East Coast Go Camp will feature Myungwan Kim as this year’s teacher. Kim is a 9-dan professional, and the only player dispatched to the United States by the Korean Baduk Association since 2008. Kim has more than 10 years of teaching experience, and his students include several US youth champions, such as Aaron Ye, Andrew Lu, and Brandon Zhou. He is also three-time US Go Congress Open division winner and currently holds the second highest player ranking in the AGA. ​If you’re a go player between the ages of 8 and 18 and would like an opportunity to study go for a week with a professional teacher, then the AGA Go Camp is for you. Camp directors Nano Rivera and Frank Luo welcome all campers to join them for a week of go-playing and fun. Anyone who participated in the North American Kyu Championships or the Redmond Cup is eligible to receive $400 off the price of the Go Camp, courtesy of the American Go Foundation. Youth who did not participate in either tournament, but still need financial assistance, are eligible for need-based scholarships here. Visit the camp website for general information, pictures from past camps, and news regarding this year’s upcoming Go Camp. Any questions about camp should be addressed to agagocampeast@gmail.com. The University of Toronto and UCLA go teams will face off in the Collegiate Go League Championship finals on Saturday April 30 at 1pm ET / 10am PT. Michael Gallucci (InSente) and William Shi 1p will provide live commentary on KGS and Twitch. Eight top schools — RPI, UCLA, Cornell, UMichigan, UAlberta, UMaryland, UCSD, and UToronto — have been whittled down to the final two in this fifth season championship. U Michigan and Cornell will play for third and fourth. American professionals Andy Liu 1p and Eric Lui 1p fought bravely earlier this week in an unsuccessful attempt to make it through the first round of the 8th Ing Pro Cup in Shanghai. The two notched strong games but succumbed in the end to the legends they were paired against in the top drawer international tournament. Both played well, according to Kim Myungwan 9p. Eric Lui built up a strong position but his opponent, Hane Naoki 9p, “was such an experienced player that he controlled the game, avoiding Eric’s provocation.” Andy Liu, facing Lee Sedol 9p, actually started ahead. “Andy was winning in the beginning, up until around fifty moves,” Kim said. 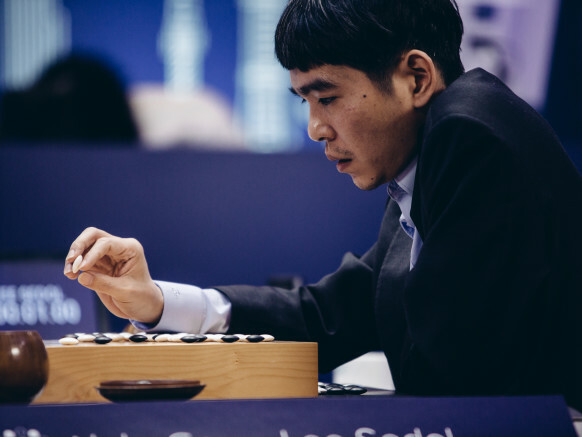 “I think that Lee Sedol was a little bit nervous because Andy started well. It’s not so surprising because Andy has played very well recently at pro tournaments. Andy later pursued territory too much which eventually backfired.” Hane Naoki fell in the second round, but Lee Sedol made it through and plays Kang Dongyoon on Sunday in the Ing’s third round. Other third round match ups are Park Junghwan 9p v. Ke Jie 9p, Shi Yue 9p v. Chen Youye 9p, and Tang Weixing 9p v. Kim Jiseok 9p. The winners will continue on to June finals in Tibet. Meanwhile, over the weekend, Liu (left in photo at right) came to the end of his run in the Kansai Kiin’s Sankei Cup. After four wins, perhaps the best pro tournament run a Western player has had in Asia, he came up short against Daisuke Murakawa 8p, a very strong opponent. All three games available below. The AGA’s YouTube & Twitch channels will feature commentary from Myungwan Kim 9p on the games of the 8th Ing Cup this Saturday April 23rd, with commentary starting at 8pm Pacific time. The Ing Cup, a quadrennial international tournament with one of the largest prizes ever, resumed play this past week, with US favorites Andy Liu 1p and Eric Lui 1p drawing hard matches in the early rounds against Lee Sedol 9p and Hane Naoki 9p respectively. Both Liu and Lui lost. Tune in on the AGA’s Twitter or Facebook feeds to find out the final pairing and any other late breaking announcements! 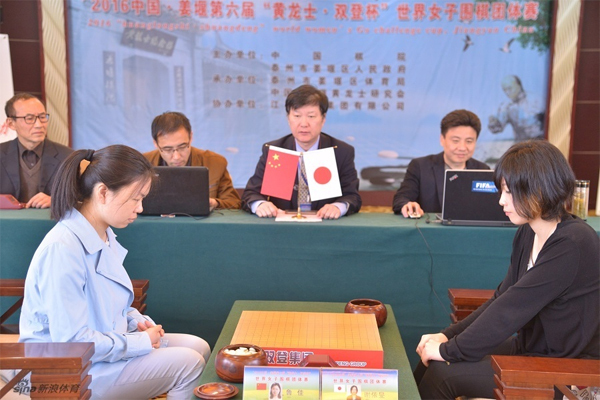 Cho U beats the odds: Some more details about the final round of the 71st Honinbo League, held on March 31. The league was in a state of flux: the only player certain of retaining his place was Takao Shinji 9P, who became the challenger. 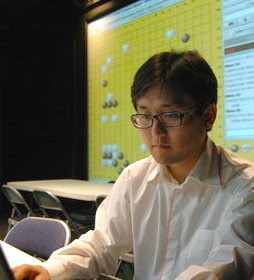 The only player certain of losing his place was Ida Atsushi 8P, whose score was 1-5. 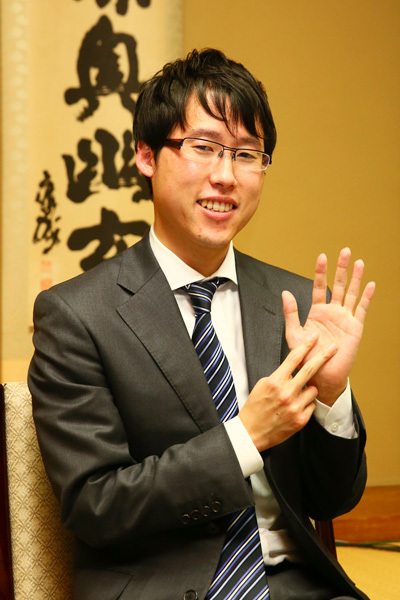 Even Motoki Katsuya 7P, who won his game and came second, would have had to drop out if he had lost. The luckiest player was Cho U, who started out by losing four games in a row, then keeping his place by winning the last three. When the final round began, though, he not only needed to win his game, he also needed to have Kono Rin 9P, Yo Seiki 7P, and Ichiriki Ryo 7P lose. According to Go Weekly, the odds of all this happening were only 1 in 16. The other three players all tied with Cho, but he was ranked higher. Game 2 (April 8). Kim (W) beat Wang Xiangyun 2P (China) by resig. Game 3 (April 9). Kim (W) beat Aoki Kikuyo 8P (Japan) by resig. Game 4 (April 10). Kim (B) beat Song Ronghui 5P by resig. Game 5 (April 11). Xie Yimin 6P (Japan) (W) beat Kim by resig. Game 7 (April 13). Pak Jiyeon 4P (Korea) (B) beat Xie by resig. The second stage will be held in the same city from June 4 to 10. Meijin League: Murakawa drops back: Takao Shinji 9P has made the best start in the 41st Meijin League with four straight wins. Close on his heels were two players on 3-0, Cho U 9P and Murakawa Daisuke 8P, but the latter lost his fourth game and has slipped back. Cho has yet to play his fourth game. (March 7) Yamashita Keigo 9P (W) beat Kono Rin 9P by resig. ; Ko Iso 8P (W) beat Uchida Shuhei 7P by resig. (April 14) Hane Naoki 9P (B) beat Murakawa Daisuke 8P by resig. 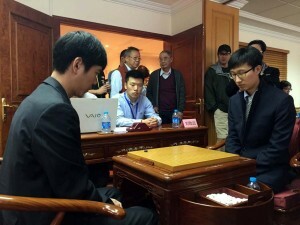 280 million watched Alphago match: According to Google, the cumulative live audience for the five games in the match between Alphago and Lee Sedol (right) was 280 million, which must be the largest audience for any go event by a long way. The estimate includes YouTube and Net and TV broadcasts in the Far East. In the wake of AlphaGo’s match, the Go Club of Strasbourg, France has been busy promoting the game with its own teaching method. The Strasbourg Teaching Method has been used successfully for a long time, indeed it won the Iwamoto Award in 2001. They have created their own software (StrasGo), which is free of charge, to help beginners learn go through this approach. As of this month it now has an English language version. For the moment it is only available for Windows but a Mac version will be available later this year. The Strasbourg Teaching Method encompasses a three phase approach, which is widely used in the schools in their local region. Essentially these phases are: 1. Capture game on 9×9; 2. Strasbourg Rules on 9×9 or 13×13; 3. French (AGA) rules on 13×13. Iyama wins Judan, scores grand slam: The third game of the 54th Judan title match was played at the Kuroyon Royal Hotel in the town of Omachi in Nagano Prefecture on April 14. 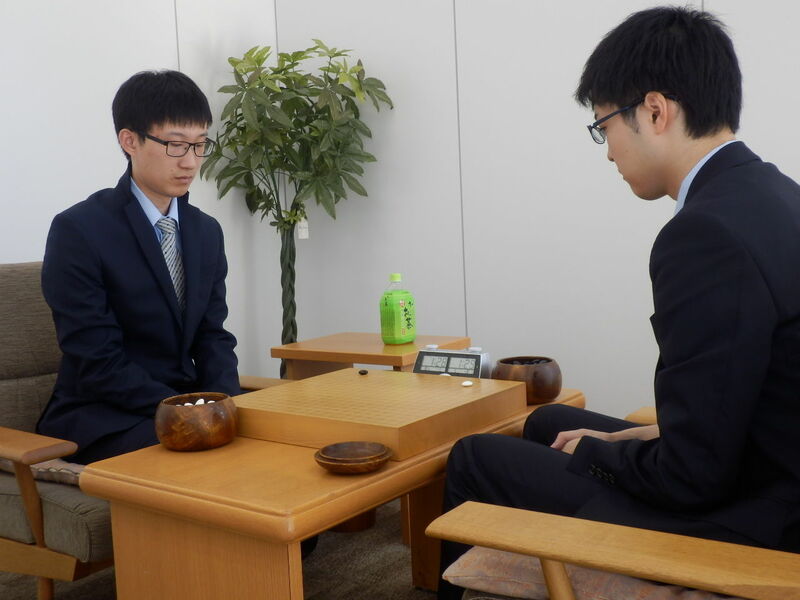 The title holder, Ida Atsushi, was facing a kadoban, as he had lost the first two games. There were about 60 reporters and photographers from 22 media organizations in attendance hoping to witness the first simultaneous grand slam in go; this was too many to fit in the playing room at the start of the game, so they had to draw lots. The game was fairly even for the first 100 moves, but Ida thought he was a little behind. The decisive fight came when Ida, playing black, invaded a corner position and, instead of trying to live small, set up a ko that gave him a chance of capturing some of the enclosing stones. The ko was an approach-move ko for Black, but Ida fought tenaciously and won it, securing the lead. Iyama was two and a half points behind when he resigned after move 269. Ida picked up his first win and stopped Iyama’s winning streak in title matches at 18. 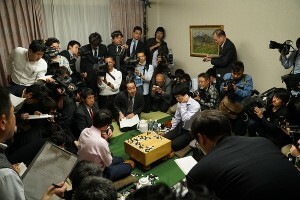 The fourth game was played at the Nihon Ki-in in Ichigaya, Tokyo on April 20. The game started at 9:30 and finished at 5:21 pm. Playing black, Iyama forced Ida to resign after 163 moves. That gave Iyama the title 3-1 and secured him the first-ever grand slam in Japanese go. Iyama has held six of the top seven titles twice, but this is the first time he has held all seven at the same time. It is his first Judan title for four years and his 37th title overall. That puts him in seventh place, just two titles behind Cho U. It is not an exaggeration to say that the possibility of this achievement has been the centre of attention in the go media for the last couple of years. Iyama has been the first player for whom this feat has appeared possible; more than “possible” perhaps, it has sometimes seemed just a matter of time. Apparently the Nihon Ki-in’s magazine Go Weekly put out an extra in the evening of the 20th. The regular newspapers sometimes put out extras concerning the tournament they sponsor, but this is the first time I can recall Go Weekly doing it. There will be a lot of celebrating going on, but soon another title match will start, so the pressure will be on Iyama to maintain this unique distinction as long as he can. The E-Journal has just gotten word that US players Andy Liu 1p and Eric Lui 1p will play two of the top players in the world tonight, starting at 9:30p EST. 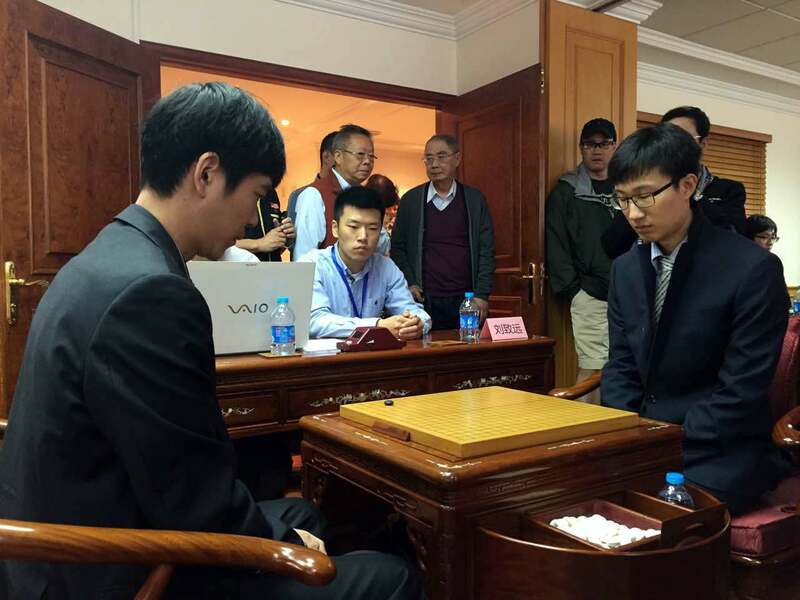 Liu (right) will play Lee Sedol 9p (left) of Korea and Lui will play Hane Naoki 9p of Japan in the first round of the 8th Ing Pro tournament in Shanghai. The games start at 9:30a local time April 20 in Shanghai, which is tonight, April 19, at 9:30 p.m. EST, 6:30 PST. The games will be watchable on Sina.com, Tygem and wbaduk, various sources say. The tournament, which is single elimination, gives each player three hours main time and two extra 20-minute periods to be bought for two points each. Please post to the AGA’s Facebook page or tweet us @theaga if you have better information about viewing the games. As a special free bonus for all E-Journal readers, Michael Redmond’s 2nd round Kisei FT game commentary against Sato Masaharu 9P appears here. Full AGA members get exciting commentaries like this every week. The game commentaries alone are worth the price of AGA membership. For youth memberships the deal is even better, just $10 a year! To sign up for the members edition, register with the AGA here.